Hariyatu Bangura is the Women’s Leader in the Western Region of the Sierra Leone Teachers’ Union (SLTU). The National Union of Teachers (NUT) has a longstanding partnership with the SLTU and with the TUC recently visitedFreetownto help to build upon that partnership. Hariyatu is a business studies teacher at the Sierra Leone Muslim Congress Secondary School in Kissy Mess Mess in Freetown. 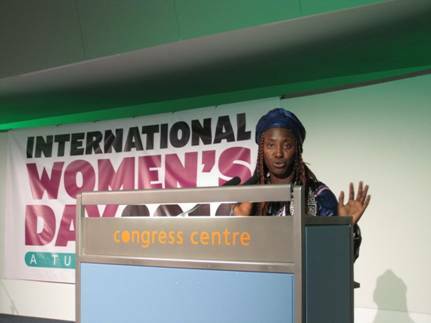 Hariyatu recognises that it is hard for women to be involved in union structures. “Women have traditionally been marginalised by men and when we go for leadership positions in the union it can sometimes threaten men, but this does need to happen,” she says. The future work of the NUT with the SLTU will aim to improve both the lot of teachers in Sierra Leone and the quality of education that children in school receive.